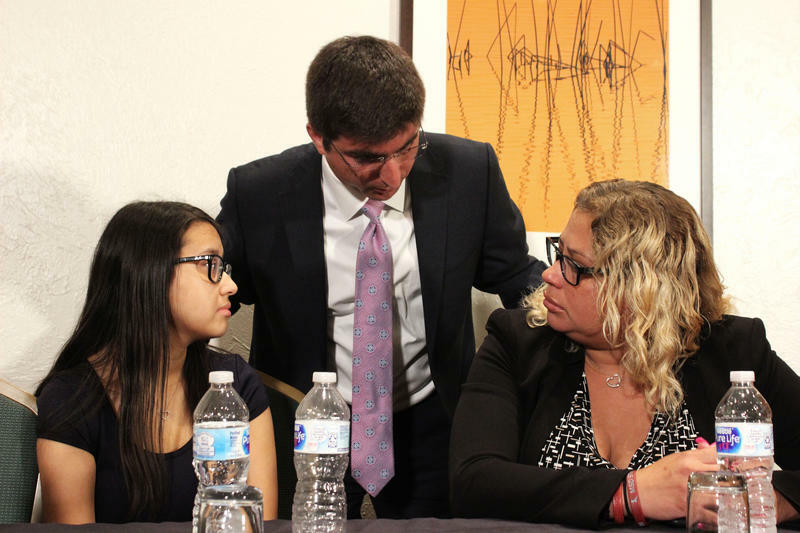 Recent MSD graduate Audrey Diaz (left) speaks with her mother, Iris Diaz (right) and Attorney Solomon Radner (center) after announcing a federal civil rights lawsuit filed by survivors of the Parkland shooting on Wednesday, July 11, 2018. The lawsuit, filed at the U.S. District Court of the Southern District of Florida, is among several that have been filed in the aftermath of the Feb. 14 shooting that left 17 people dead. According to Attorney Solomon Radner, the lawsuit is looking for unlimited compensation for the psychological trauma suffered by survivors of the shooting, as well as for the violation of MSD students' Fourth Amendment rights during an illegal search and seizure conducted by the school's Resource Officer Scot Peterson the day of the shooting. It also alleges "numerous failures" by law enforcement and Broward school employees that made it easy for shooter Nikolas Cruz to enter the building and carry out the attack. "Cops are heroes, and they're supposed to be heroes - that's what their job title is, it requires them to put their lives at risk for others," Radner said. "This lawsuit should not be misconstructed in any way as a shot at law enforcement. This is a shot at specific law enforcement officials who failed students on that particular day." None of the 15 plaintiffs involved in the lawsuit were shot at Stoneman Douglas, according to Radner. Defendants include former Broward deputy Scot Peterson, who was tasked with protecting the students at Stoneman Douglas High School. Cameras around the school and radio communication with law enforcement have shown that he never entered the building to confront gunman Nikolas Cruz as he opened-fired on campus on Feb. 14. The lawsuit says Cruz took his time and marched through three floors while Peterson seeked cover and claimed to be assessing the situation. Other defendants include Jan Jordan, the Broward County Captain who refused to allow the Coral Springs Fire Department to enter the school with paramedics, and Broward school guard Andrew Medina who spotted Cruz and could have stopped him from entering the building. 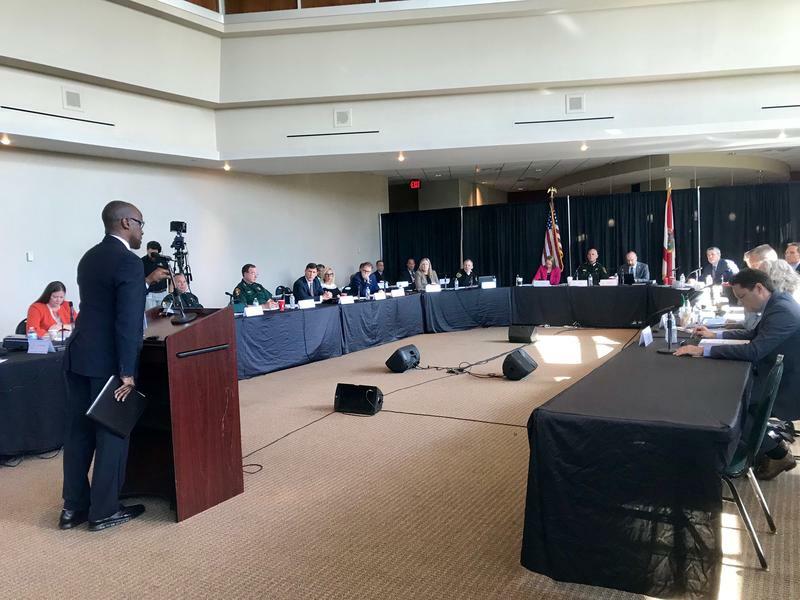 Broward Superintendent Robert Runcie and Broward County Sheriff Scott Israel are also included in the list. According to the lawsuit, Medina recognized Cruz walking into Stoneman Douglas carrying a bag. Documents indicate that Medina knew that Cruz was expelled from Stoneman Douglas in 2017 and was banned from wearing a backpack on campus because he made threats against other students. Medina did not even call a code red, which “would have put the school on lockdown and prevented most if not all of the harm.” He claimed school procedure was not to call a Code Red unless a gun was actually visible - but if this is true, the lawsuit claims Broward County school policy and training is to blame.